Long-time cryptozoology researcher David Hatcher Childress takes us on a tour of Bigfoot Nation—the apparently real world of bigfoot around us in the United States and Canada. Surviving in the shadows and suffering from loss of habitat, bigfoot has had many encounters with humans, many of which are chronicled here. In these meetings, bigfoot has been found to be curious, dangerous and even amorous, depending on the circumstances. Whether real or imagined, the fact that bigfoot has made his way into the psyches of Americans and Canadians cannot be denied. He appears in commercials and movies, on roadside billboards and stamps. In fact, bigfoot is everywhere, trying to maintain his lifestyle on the fringes of modern society, and gently creeping into our dreams. Join David on a wild ride through bigfoot country beginning with the very first reports from the 1800s and continuing through today. Includes 16-pages of color photos that document Bigfoot Nation! Plus The original 1971 movie on bigfoot! This color film made the drive-in circuit throughout the summer of 1971 and featured great special effects and scantily clad hippie chicks. Has a 150-year-old legend come true? In the wilds of the rugged Northwest humans are captured by the legendary bigfoot. It soon becomes evident that a whole colony of these creatures exists and they intend to mate with their prey! As the original poster for the movie said: “America’s abominable snowman breeds with anything!” Starring Chris Mitchum John Carradine, Joi Lansing, John Mitchum, and Lindsay Crosby. Plus snack bar commercials and bigfoot-troglodite trailers. BIGFOOT NATION PLUS BIGFOOT THE MOVIE SET. 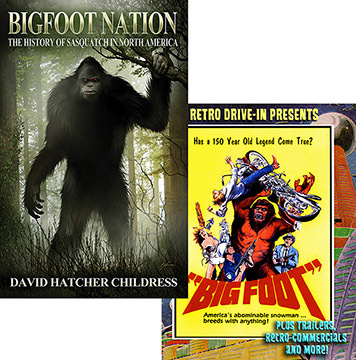 Includes the 346 page book and the DVD of Bigfoot: The Movie, the original 1971 Feature.